Every child deserves access to high-quality early learning experiences. NAEYC-accredited early learning programs are exceptionally well equipped and meticulously measured for indicators of quality in the classroom and beyond. From guidelines for teacher preparation through safety standards, NAEYC Accreditation ensures that programs are safe, well prepared, and intentional about ensuring children’s success. As a reputable indicator of quality, NAEYC Accreditation correlates with children’s greater readiness and success in school and beyond; increased educational attainment rates; and overall healthier lifestyles. As a facilitator of quality-improvement initiatives in classrooms across the country, NAEYC Accreditation is dedicated to ensuring that teaching staff and administrators have access to the latest research and use the best practices in the early learning field. With over 7,000 accredited programs nationwide, NAEYC offers new programs pursuing accreditation access to a vast network of high-quality accredited programs and research to learn from. Staff at NAEYC-accredited programs report enhanced team spirit and commitment to workplace success resulting from the self-study and preparation processes for accreditation. By ensuring that all aspects of their work environment meet NAEYC’s research-based program standards and criteria, staff have a direct hand in establishing their professional environment and contributing to its success. Programs that pursue NAEYC Accreditation join a community invested in ensuring quality early learning opportunities for young children everywhere. In addition to program accreditation, NAEYC has an expansive system of affiliate offices across the country who represent 60,000 early learning professionals worldwide who advocate on behalf of young children everywhere. NAEYC’s resources for families, practitioners, and programs create a web of support and connectivity, making NAEYC the foremost association in the field of early learning. Below you will find more information regarding the steps for becoming and maintaining you NAEYC Accreditation. Just identify where in the process you are, follow the arrows, and review the information for each step to the side. 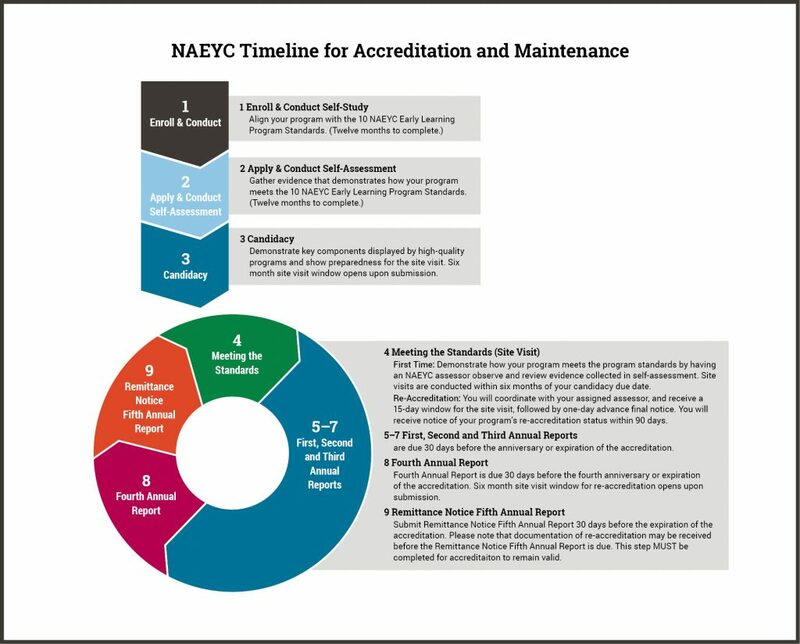 NAEYC accreditation also utilizes a very specific timeline. Each step of accreditation defines the timeline for the next step. For instance, the first step “Enroll and Conduct Self-Study” is limited to two years. So, in applying for step one, you agree “Apply and Conduct Self-Assessment” within two years. Use the table below the graphic to identify the right timeline for you! Follow the link below directly to the NAEYC website and read more! AS OF NOVEMBER 5, 2018 all NAEYC Early Learning Accreditation paperwork is available digitally on the NAEYC Early Learning Accreditation Portal. For more information on log-in credentials, please visit here. You can also view the videos below. AS OF JANUARY 31, 2019 all NAEYC Early Learning Accreditation documentation MUST be submitted through the NAEYC Early Learning Accreditation Portal. Having trouble with the early learning portal? If you still have questions or need guidance, we recommend contacting NAEYC Midwest Technical Assistant Consultant, Keisha Spates. Keisha can provider you guidance over the phone or can come to your facility and provide you or your staff with training in any area of the accreditation process. To schedule a consultation or conversation with Keisha, just follow this link: https://calendly.com/kspates. The process for becoming NAEYC accredited is not easy, but anything worthwhile is worth the work. NAEYC and Indiana AEYC want to make that work as easy as possible and have provided tons of resources. From slideshows to trainings to on-site technical assistance, we have it all below! NAEYC now offers a myriad of tools and supports for FREE to the public, including all Self-Study materials to prepare your program for the first step of Enrollment before you pay! Just link the link below for support from the experts at NAEYC. Contact NAEYC Click here to schedule a consultation today with Keisha Spates, Indiana’s NAEYC Specialist! She can come on-site to your facility and provide training, technical assistance, or answer your questions!